hw-8 Smart Retransfer Printer is suitable for the production of high quality ID cards in the economic segment for mid range quantities. 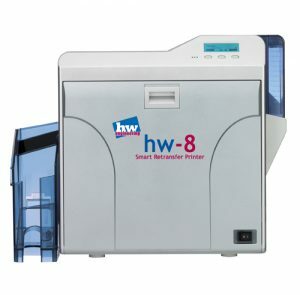 The hw-8 is based on the experience with the hw-1 Retransfer Printer. with modules for encoding of smartcardshw-8 is available as a single- or double-sided printer. In addition the hw-M Security Lamination Module can be used to apply any kind of laminate.